Professional Beauty is the leading B2B magazine for the Australian aesthetics industry and has been recognised as the ‘bible’ of the beauty industry for well over a decade. 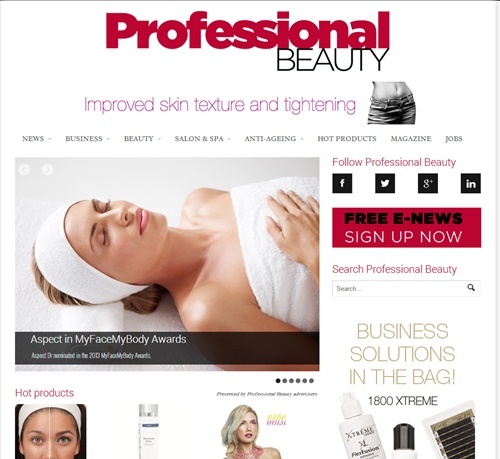 Professional Beauty offers a comprehensive news service for Australian aesthetics industry professionals. Content includes local and international news, events calendar and reviews, feature articles, interviews with industry identities as well as training videos on treatments from a cross-section of suppliers. Industry personnel are kept well informed with the latest developments in their industry via a free twice weekly e-newsletter – subscribe. Professional Beauty also publishes a bi-monthly print magazine. All six issues contain a mix of new product information, local and international news, specialist contributors, business and features articles and industry profiles keeping beauty therapists and skin clinicians educated and informed.